Hummm........... They wanted us to name our blocks????? How about Oaky Doaky!!! That's pretty corny! Fall is my favorite time of the year. I can finally shake out the quilts that have been stored for the summer. Watching the trees change to the beautiful golden yellows and oranges. Whew, does it get any better than that? Our leaf theme is perfect for the season, and it got me to thinking about a technique I hadn't done in a few years now. Put a little dishwasher soap in a dish to start. Carefully apply to the fabric making sure your stencil doesn't slip while you working with it. Just a note of caution. Less is best. My tendency was to glob a ton onto my fabric, but that just makes it easier to push under the stencil, which is what you don't want. Set your fabric out in the sun until the dishwasher soap is dry and then give it a good rinse. There are assorted bleach stop agents on the market. I didn't use any for this little project. The options are endless when it comes to discharge. You can create some very unique and one of a kind fabrics by playing just a little bit. Experiment with those big foam stamps, or those brass stencils they use for scrap booking. Heck you can ever put it in a bottle with a glue "type" tip on it, and write with your dishwasher detergent. The sky is the limit. You will find that you will get different results with different fabrics. Here I used 2 different black fabrics. You can tell how different they discharge. It's not uncommon for a fabric manufacturer to over-dye a fabric with black, if it didn't print, or dye correctly. I've seen some stunning blue's come thru with discharge, but unfortunately haven't found any for myself yet. I do enjoy picking up a variety of black fabrics to play with, and see what I get! Laura Murray Designs is where the stencil I used came from. You might know Laura for all her fabulous work with Paintsticks! I loved it, but knew that I wanted to keep my border colors consistent through out my quilt. I am going to share with you how I did it for this project. I started with 2, 2 1/2" strips pieced together and pressed open. I made my triangle template by using painters tape and my ruler. Now we are going to take another 2 1/2" strip and stitch down all our triangles. Just keep adding them as you sew. Press open, and this is what you have! You can see from the block how it goes together from here! I had so many of these little leaves, that I put together a table runner, and made a few of these fun, free standing (or hanging) leaves, like the ones on my block. They will make for some fun package wrappings! A big thanks to Madame Samm, and to Cherry for stepping up and keeping us all in line! We couldn't do it without either of you wonderful girls! Now you all know how much I love give-a-ways! I have a lovely layer cake from Connecting Threads. Yummm, just think of the things you can do with em. Here is the list of todays bloggers! Oooh your quilt is fabulous - love the colours, and I love the tutorial about bleaching fabric - will have to have a play as its something I have never thought about trying. Thanks for sharing. Thanks for your great post and project pictures. I cant wait to try the border the way you did it. I have been wanting to get a layer cake and try the quilt from Missouri Star Quilt Co. She has really great videos. I'm a new follower and I can see I'm really going to enjoy your blog. Thank you for sharing this! I'm going to try this method of discharging as soon as I can buy some detergent(I use the tablets! )It is so effective! If I was lucky enough to win your lovely giveaway I would make a simple quilt and try discharging/bleaching on the blocks! I'm a follower. I love this anti-dye method. May have to try that! I think I'd make a simple quilt if I won. Thanks for the chance. I love your block! It is so gorgeous. Thank you for sharing. This is wonderful! Love oakey dokey! Thanks for sharing the process from start to finish. Love both little quilts. I am already a follower and would love to use the layer cake in a cuddle quilt! Very cool little project. Thanks for sharing today. Hey, its really very fantastic post. I can't wait to try this method now. These patterns and colors are very attractive. Thanks for sharing this with us. Beautiful, love your Oakey Dokey and what a great technique - thank you for the tutorial. Thanks for the great tutorial - if I won your giveaway, I would learn how to do discharge fabric dying!!! Love this so much, even though I follow, I'm bookmarking this page so I can figure out how to do this! I hope you can do discharging on colors other than black...but I have a few of those to try it out on too!!! Love your bleaching tutorial. It really gives a soft look to your little quilt. Thanks so much for the giveaway too! Thanks for the tutorial. Love you table runner, sew different. Thanks for being part of the "Leafs me Happy" hop. Thanks for the Turorial. If I won I would give your block a try. Thanks for the bleach idea I never saw it before. I am a new follower. Your block looks so righ!! LOVE it! Thanks for the tutorial~I'll have to give that a try! I love the way your table topper came out! Beautiful! Wow, your quilt is lovely and so original! Thanks for the chance to win the tonal fabrics! I am a big fan of scrappy quilts and that collection looks like perfect start for a fall scrappy quilt! Thanks for the tut! Will have to try that...I am already a follower and your finished project is stunning...thanks for sharing! I am a follower and really like your table topper. I will have to try the color remover technique (great tutorial). I was surprised too that the pen didn't work. Usually when I use bleach, a drop managed to get onto my clothes that should not be bleached and the color instantly is gone! I would use the fabric for some pretty pillows. I am a follower and thanks for showing us the technique for your project. I have no idea what I will do with your wonderful prize but I will do something. Thanks. Very interesting technique and the table runner is amazing! Looks so great!! Great project!!! I have also tried the Chlorox bleach pen with no success. I wonder why? I would cut them up into 2.5 by 4.5 rectangles and use them to add punch to my "Learning to Like Scrappy" quilt. Thanks for the lesson on discharging. Thanks for the tutorial. I hadn't used the detergent with bleach before, but I did use the Clorox bleach pen and it worked great for me. Maybe you got a dud? Anyhow I love your leaf quilt. I am a follower (new). WOW, let me think, where will I start... thanks for the great tutorial, what a stunning idea of making your own design on fabric. I love your tablerunner and quilt, thanks for sharing. You make me want to run out and buy a stencil just to try this method. Your runner is absolutely beautiful and the border tutorial was great. Thanks for the lovely visit to your blog! I do follow; and I love you piece...escpeciall with that adorable little teapot on it!! What a beautiful idea! I am going to have to give this one a try. I love your little leaf cluster on the corner too. If I were to win, I think I might have to give this technique a try. Beautiful block!! I actually belong to a dyeing bee and we've done some discharging - isn't it FUN!! I love not knowing what you're going to end get - just like a "box of chocolates"! lol Your finished piece is absolutely beautiful! I'm a follower! Thanks for sharing and the chance to win your wonderful giveaway! Love thr table topper. I had totally forgotten that technique. We used to do it when i was a girl in 4-H. What fun. Thanks for the opportunity on the draw. Not sure right now, what I will do with it, but i know I will do something. I am an existing follower. Thanks for the great tut and the wonderful draw. That is amazing. Thank you for the tutorial, I am going to give this a try. I looks like a lot of fun and your outcome was beautiful. Just beautiful...thank you for sharing this technique. I love your tute,hope I can do this. I would make a ..................bag?? maybe or a lot of mug rugs for Christmas, or notebook covers...Who knows. I might just hold them for a while. Oh yes, I am a follower. Thank you for taking time to participate in the blog hop. I am learning new techniques. You are very generous in your giveaway. I've never had a layer cake. Therefore, I'm not sure exacty what I would do with it. I'm making a couple of quilts that could use some small pieces of fabric and that just might fit the bill. I am hand appliqueing a Sunbonnet Sue and Overall Sam fot twins. I am using polka dots and the solids might be what I need for some coordinating fabrics. How fun! That is something to try for sure. Thank you for the tutorial. And your block is awesome! HI! SUCH A NEAT POST! I'D USE THESE IN MORE THAN ONE QUILT AS BLENDERS! Thanks for the tutorial! I love your Fall creations :) If I won, I would love to make a quilt with the beautiful fabrics. Oh this is a stunning mini, it is marvelous indeed! Thanks for the tutorial - very interesting technique. Would love to win the layer cake - I'd add some cream fabric and try a rail fence variation quilt. Thanks for the chance to win. Thank you so much for your post and creative projects! If I win, I'd use that layer cake and incorporate it into a scrap quilt that I am currently working on. I'm a follower! Your leaf projects are so beautiful! Thank you for sharing and for the give-away. Your technique is awesome...thank you for sharing!! I'm a new follower and can't wait to delve deeper into your blog. I LOVE connecting threads mirage tonals...they have become my goto for blenders when I need just a bit of texture. I have ALL kinds of projects in mind for using them!!! What beautiful autumn leafs you made. I am seriously going to try the bleach technique. If I won the layer cake of fabric, I think I would take advantage of the bold solid colors and make a quilt of sawtooth stars (or something similar) that would 'pop' on a black or navy background. Wow great project. I love the 3D leaves on the first one. Beautiful!! That layer cake would looked good mixed in a pineapple quilt. Lovely. Rosemary B Here: Oh I have been a follower for a long time now, sweet friend. Thank you for sharing your knowledge. I love this idea. I want to try it. Such a fun mini! Love the addition of the dimensional leaves, such a pretty finishing touch. Interesting to learn about those bleach pens and see how you would use a stencil with them. You have such creative ideas and how lucky for us that you share them! Wow! Never heard of that technique. I will be trying that! Pretty leafs template! Great project. Thanks for inspiring! Oops! I'd make some kind of rainbow quilt with that lovely bundle! Love how your block turned out, just beautiful! This discharge method is do different from others I have read about. Sounds like something even I could do! Thanks for the tutorial and the great giveaway. I am a follower. Love your quilt - the colours are amazing!! Thanks for the tutorial... I would love to try something like this!! I am a follower. I'm a follower. Hhhmmmm......Tonal Layer Cake? What would I do with it? Maybe I'd try some of that discharge with stencils that you so nicely showed us. Looks fairly easy and fun. I'd love to try your discharge method (on some of those yummy colors). Maybe your Clorox pen didn't work because your fabric had a coating on it... did you wash it first? Lots of the paints want you to wash first. I am a (new) follower. Love these "hops", you find such delightful sites. Never thought of purples for fall.....how wonderfulthey look. Thanks for the wonderful tut! I'd like to try something like that with the beautiful fabric giveaway. I have a neat new English Paper Piecing pattern that I would like to try out. Bright bold solids would look wonderful as the centers surrounded by white. It is a sort of quilt as you go type of thing, and I have been trying to think of what to use in the centers. These would be wonderful if I were lucky enough to win. I am a new follower by email. I am also new to quilting. 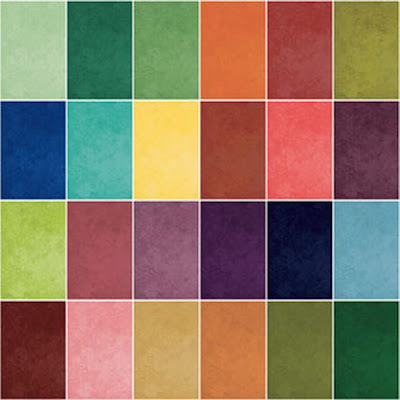 I would love to use these bright bold solids in the Beginner's quilt along at the quilting gallery. I am a new follower. I love your fall quilts you shared with us. Thank you. I absolutely LOVE the elk photos. Wish we had them around my home. Awesome. 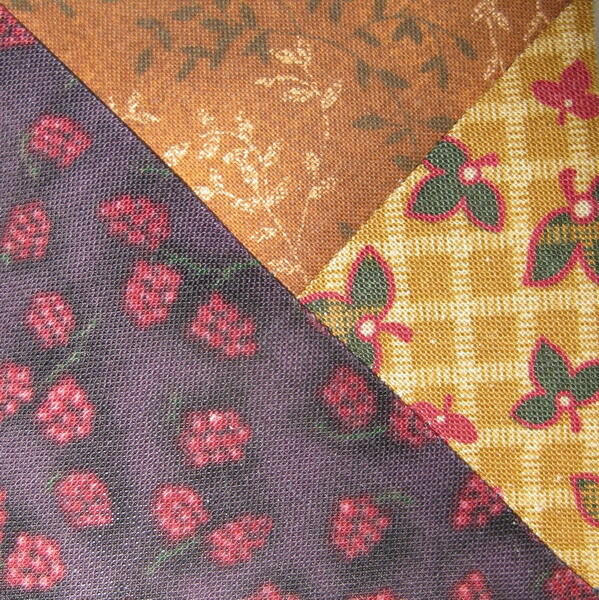 I love solids in quilts. I would make my granddaughter a nice quilt for Christmas if I won. Love your creation! The colours in the runner are fabulous. Probably will combine them with calico's, as I am not too much of a fan yet of all solids in a quilt. Thanks for sharing. What a gorgeous little quilt! I might have to try that technique-thanks for showing us how. As usual, you've come up with a unique project. That's why I follow you-lots to learn and enjoy. great creation and thanks for sharing the steps. OH MY!!! LOVE your blocks!!! And now there is another technique that I'm sooooo going to have to try. Thank You for the great tutorail, I'm sure to try this one soon. Thank your for sharing it with us and thank you for the chance to win that great layer cake! Con tantos colores se puede hacer un arcoiris. Gracias por los 2 tutoriales. Me ha gustado mucho el del jabón. I new way and a new thing to try. Thanks for the tutorial. Oakey Dokey - what a perfect name for your block. I love the colours you have chosen and the addition of the 3D leaves in the corner. Oh my gosh...how fun is this! Love the dimension and color. Fantastic! Wow! This is a gorgeous table topper! Love the techniques you detailed. Thank you for participating in the hop and the generous giveaway. The colors are beautiful! Very creative! Thanks for sharing the technique. I'd love to win the layer cake and would make a quilt of course! I loved your block, I will have to try that tecnique. I would enjoy placing the tonal colors in a variety of quilts. There is alway one color you are unable to find when doing a quilt, This would be my stash of just the right colors. What a great table topper...love what you did with those extra leaves! Thanks for sharing the technique. Thanks for the sweet giveaway...I'd use it to make a colorful chevron quilt. Wonderful project. I love it! Well, I am learning so many new things today. I didn't know about black fabric sometimes having a colour underneathe. I have never heard of using dishwasher soap to get this effect. This is a really neat block. Your button with extra leaves is such a nice touch. Thanks for sharing. Great giveaway. If I won, I would spend so much time petting the fabric and dreaming that my cat would get jealous. Love your block and thanks for the wonderful tutorial I will have to try it looks like fun. I really love this block and thanks for the tutorial , this looks like a lot of fun. I am follower. Ok-If for nothing else, joining the Leafs Me Happy Blog Hop was well worth it to find your blog. Shall I admitt that I went snopping around and LOVE LOVE LOVE what you are into. So I am awaiting future posts to see what you are up to. And for the layer cake, I am so Happy right now--I have know idea what I would do with it--just give me time to settle down and I will come up with something. Very informative tutorial; I'd never heard of doing this before. It looks doable and your finished product is stunning. I would use the tonal layer cake in a fall quilt I am pulling fabrics for. Thanks for sharing and for the chance at your giveaway. I'm already a follower. If I win I would make a fabric basket to hold my cross stitching supplies. I am a follower! I quite enjoy your blog. I would use the fabric to English Paper Piece. This is a new obsession for me. with that tonal layer cake, i'd give your tute a try, working some designs on them for a colorful lap quilt. should be a lot of fun working with the stencils i have. sure am happy to be a follower of yours, with your bright ideas and great new techniques. I would use them for leaves in a lap size quilt for my couch. Thanks for the chance to win. I like the way your block turned out. I'm a follower. Your projects are great. I'd love to use the layer cake for some great applique flowered blocks. What a coincidence that you used color discharge for your Autumn leaves! I had just found some instructions for using color discharge on a quilt top-- I had jotted down the instructions a couple years ago after seeing a quilting show about the technique. Your leaves are lovely!!! Now I can't wait to get started! If I were the lucky winner of your giveaway, I would use those beautiful colors in an Autumn quilt that I've been saving fabrics for-- those wonderful blenders in all those beautiful colors would be perfect! I love your technique and can't wait to try it! This was a beautiful project. Oak leaves are my favorite. I am a new follower. If I won, I would use this fabric to make a beautiful leaf quilt. The colors are gorgeous. OMG! That quilt is so gorgeous and unique. Wow. I even had to call my husband from the other room to see it. Amazing. I am now a follower. I never tried color dis-chard but after the lesson you shared It is on my to do list. I could see a lap quilt in those lovely colors. There is quite an elegant feel to your projects! They are wonderful! Thanks for sharing your techniques. I would use those solids in a lap quilt. That is so stunning. Beautiful, warm, peaceful, Beautiful. Thank you for sharing. It has been a pleasure visiting here and seeing what you made I would use those beautiful tonals with some fabric I bought just today to make some fall table covers that I designed the other night. Wow! Thanks for teaching us the discharge technique & the border technique too! It's absolutely beautiful! Thanks for inspiring us today & giving such a generous giveaway! I would probably spend time petting the fabric as I decide what to make with it.. Something fun for sure... Something with movement maybe pinwheels and/or appliqué flowers! Maybe tonal granny squares! Use the scraps in a postage stamp quilt! Loved your block/topper for this hop. Thanks for all the tips on bleaching fabric and also the tut on the border - darling. Yummmy colors - not sure what project I'd use the layer cakes for but I'm always looking for solids. Thanks for the chance. Thanks for the great tutorial. I often use layer cakes to comprise alternate blocks with pieced blocks. Sometimes I just put another border around them ...makes a great quick quilt that I use to giveaway to friends going through various stresses. Thanks for a the wonderful information. I guess it is time to get some dishwasher detergent and I do not have a dish washer. The table topper turned out awesome. Beautiful block. Thank you for the tutorial. I always learn something when I visit! Hi!!!! Love the top block!!!! Very pretty!!!! Love the leaves!!! Thanks for the technique!!!! Wonder how it would work on denim!!!! Look out jeans!!! Here comes the dishwasher soap!!!! Hee hee I love the fabric in your give a way!!!! Lots of fun!!!! I am not sure what I would use them in but they would be fun to play with!!!! I am a follower!!!! Thanks for the fun!!!! Love Connecting Threads. Nice giveaway. Loved the tutorial!! Loved the leaves!! Oh boy I just love your tutorial and quilting. I live in oaks and I am going to have to try this. I would use the giveaway fabric to make a quilt using your technique with some and add the others to some fall fabrics that I already have. PS - I am a follower. I am loving this hop. Fall is my favorite time of year and I just love all of the blocks and the colors. I could go on and on!!!! Great tutorial! I'm going to try the border on a quilt in a round robin. I'd use the layer cake in a quilt. Thanks for the giveaway! this is just a wonderful concept. The end results are terrific. Will need to try this at some point just need to come up with an idea. I get a tip by my dear friend to your blog, she won the dot fabrics and she told us you where so super and nice to follow so i signed in right now. and i can get on a giveaway right now. what a generous give away! I just found out I am going to be a GRANDMA (first time) ! I am starting a list of things I want to make for the baby, a quilt, bibs, burp cloths, diaper bag, and changing pad. I am sure I could make use of some new fabrics. I have very few solids in my stash. I am anxious to try your stencil idea...Thanks for sharing! Wow such great ideas. I love the idea of taking the colour out of fabric. I think I will have to try this before too long. Thanks for the tutorial ... Looks like fun! I'd use the layer cake to make a modern quilt of some sort! I love this idea!! I have never tried it before!! This looks like a lot of fun!! Your quilt looks amazing!! Thanks for sharing!! Great tutorial and what a fun design. Thanks for all the tips. I would use the lovely layer cake from Connecting Threads to help finish an I Spy quilt I am working on. Wow, that is an awesome tute! I signed up for your emails so I can remember to try the fabric "undying" next summer. I am really really wanting to get into dying my own fabric. I bought a bolt of ready to dye fabric and have been researching on the net but that's it so far. Any suggestions for books or materials would be welcome! Oh, and if I won the layer cake I would try the modern mystery quilt AQS has going on! I'm going to try this on the first sunny day we have! Very cool! Thanks for sharing a "new-to-me" technique! I love your border triangle technique. I just finished a table runner with lots of those kind of triangles and I wish I had seen your technique first. Maybe I could try it again in some of those yummy solids. Hiya! I am an email follower, so I get all your posts---YAY. Thanks for the tutorial, will be interesting to try. Love your oakey dokey block (great name too). What would I use the layer cake for??? Hmmmm, maybe some pretty pillows, maybe a table runner and some placemats, maybe a lap quilt. Not sure, just yet. Thank you for sharing your work, and for having the giveaway. Blessed be, hugs!!! Thanks so much for the tutorial. This technique is new to me and it sounds like fun. Your quilt looks gorgeous! The layer cake fabrics look yummy. I'm not sure if I would use them all in one quilt or not. Thanks for the giveaway. I'm a follower.